There are plenty of beautiful parks in New York where you can retreat from the city. 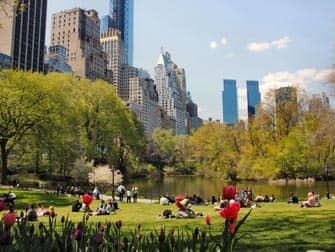 Despite New York being known for having the highest skyscrapers in the world, there are great parks where you can relax, take a walk or have a bite to eat in. 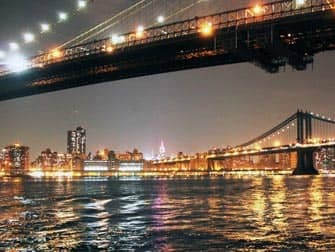 Below I’ve listed several parks in Manhattan and Brooklyn that are worth visiting. Central Park is the largest and most famous park in New York. For many New Yorkers, Central Park is their backyard where they can retreat and enjoy a relatively quiet area. 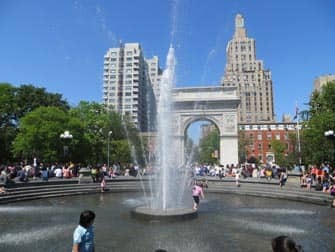 Washington Square Park is located in New York in Greenwich Village. Fifth Avenue begins at Washington Square Park. The name comes from George Washington, the first president of the United States. In 1827 it officially became a leisure park. In Washington Square Park there is a large arc, which honours George Washington. An interesting thing about this arc is that it is modelled after the Arc de Triomphe in Paris. Washington Square Park is a popular place to meet up. It’s popular because of its location in Greenwich Village. It is just across the street from NYU, the vibrant urban New York University. Next to that, just a block away in any direction, there are rows of shops, cafés, theatres and nightclubs. This is the place to go out, shop or relax! There are many street performers in the park who entertain passersby. Under the arc music is often played and there are many places to play games, which is why a lot of people come to this park to play chess. Tourists, students, artists and locals, everyone comes together here. It’s where you can see why they call New York the melting pot. 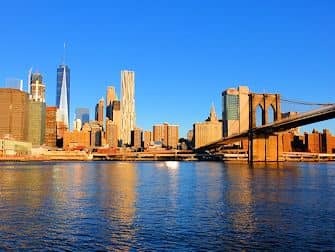 You’ll have the best view of Manhattan from the Brooklyn Bridge Park, the park is located by the water under the Brooklyn Bridge. Here you can take the most beautiful pictures of the city. You can sit on the steps of the park or relax on the grass, for the smaller children there is room to play in the playground. If you are in New York in the summer, it is very nice to go to the Pop-Up Pool, where you can cool off in the pool. 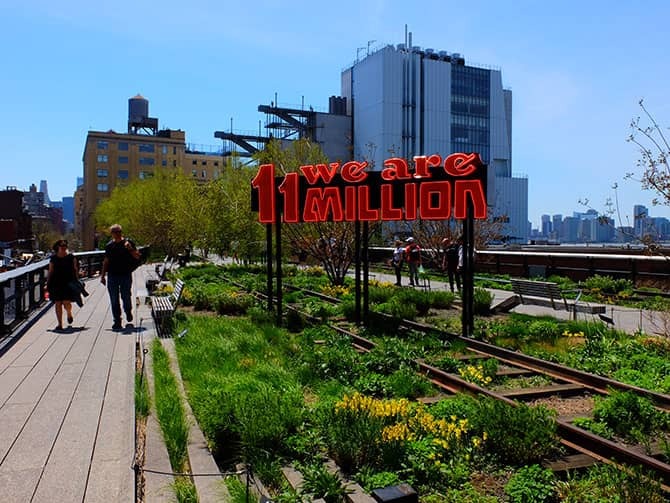 High Line Park in New York is like no other park. This park is situated on an old railway track that runs above the city. From the High Line you’ll have great views of Manhattan and the East River. It’s nice to combine a walk through this park with a visit to Chelsea Market and Hudson Yards. Madison Square Park is located in midtown on Fifth Avenue. 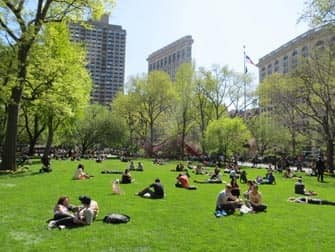 If you would like to briefly escape the bustling city then just relax in Madison Square Park. The park has nice fields where you can retreat and there are also play areas for children. During the summer holidays, many musical activities are organised for children. 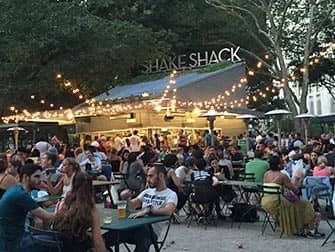 Shake Shack is located in Madison Square Park, where you can eat the tastiest burgers and drink the best milkshakes. Do you want to contact your family or friends at home? At Madison Square Garden you can use the free WiFi. Do you love art? 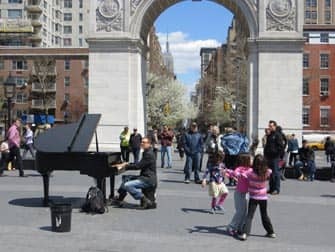 Then it’s definitely fun to go to Madison Square Park, the park often has temporary exhibitions where different types of artworks are exhibited. Battery Park has a great history. In the past, before people came in through Ellis Island, the immigrants arrived through Battery Park in New York. From Battery Park you have a beautiful view of the water, you can see the Statue of Liberty and Ellis Island. The ferry departs for Liberty Island from here. The park has a nice atmosphere and is extremely popular. Regularly concerts and festivals, like the Swedish Mid-Summer Festival, are held in Battery Park during summer. The park has beautiful flower gardens. It is worth admiring them, especially if you love flowers. A bit further away, in Wagner Park, you’ll find Gigino, a swanky restaurant with a killer terrace where people meet after work for drinks and bites. This restaurant is also one of the most romantic restaurants in the city, so if you want to splurge, this is a top choice! Battery Park is often the starting point for walking tours through Manhattan. 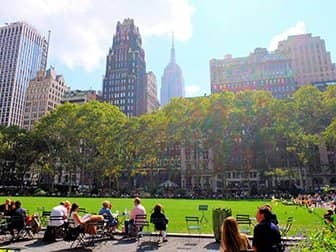 For every season in New York there is something to do in Bryant Park. In the winter there is an ice rink where you can skate. 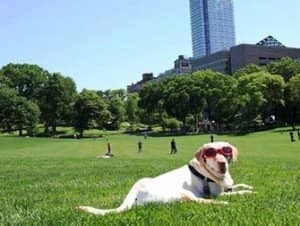 In the summer there’s a lot going on, you can watch free movies during the Summer in Bryant Park and attend yoga, dance, and Tai Chi classes. Bryant Park is centrally located in the middle of Manhattan. It is close to Times Square and the Theater District. It is also close to the New York Public Library. Bryant Park has the best scene for drinking outside in the warm summer weather. The place is packed with yuppies that come to meet with friends for drinks after work. 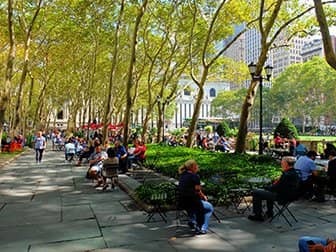 It is definitely worth visiting Bryant Park, it is a small and cozy park. 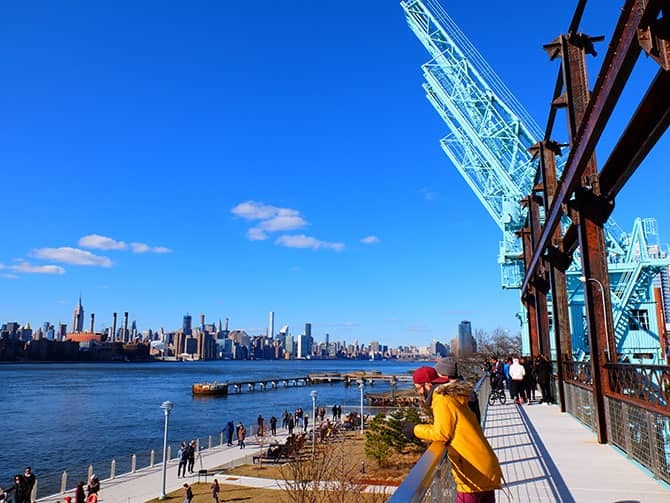 Brooklyn’s newest asset is Domino Park, located along the East River in Williamsburg. 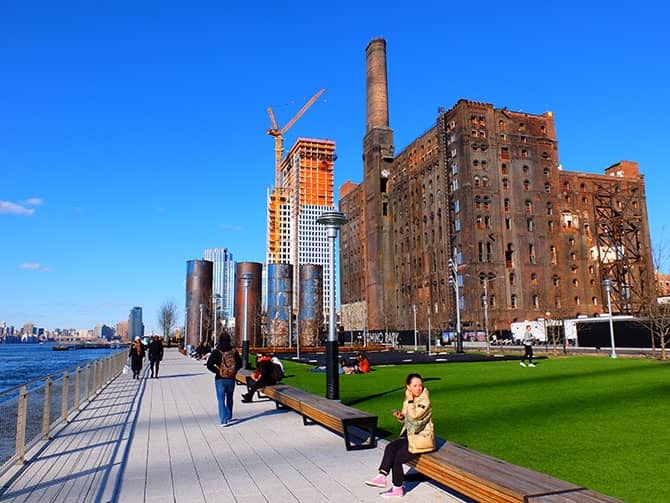 It’s named after the former Domino Sugar Refinery, as the park is built on its site. The extensive park consists of a variety of elements, like a playground, a beach volleyball court, elevated walkway and of course lots of greenery. One of the highlights of the park is the fog bridge, a bridge surrounded by misters, creating a cloud of fog that surrounds the visitors. Paley Park in New York City is a hidden treasure in Midtown Manhattan. It’s a little oasis in the middle of the busy city. There are trees and ivy growing along the walls, the highlight is a 6-meter high waterfall that is located at the end of the park. The beauty of this waterfall is that the sound of the water tunes out the city noise. The park has been named one of the best parks in the world. It is an extension of the environment in Midtown, but at the same time it seems as if you are far away from the crowds. In this small park, there are five decorated pieces of the Berlin Wall. 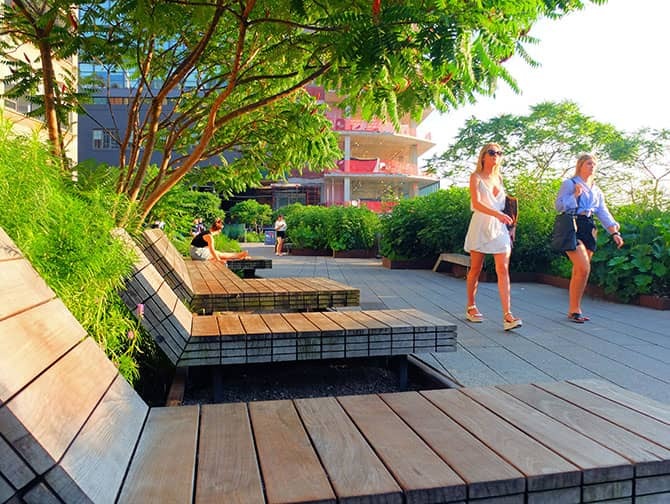 The park is located at 3 East 53rd Street between the business offices. Prospect Park is in the middle of Brooklyn, it’s nearby the Barclays Center (where the Brooklyn Nets play) and a variety of museums in Brooklyn. The park is known for its man made waters, although the biggest part of Brooklyn’s natural forest still remains in the park. During the winter there is an ice skating rink in the park and during the summer there are also a lot of activities. You can even go fishing in the park. 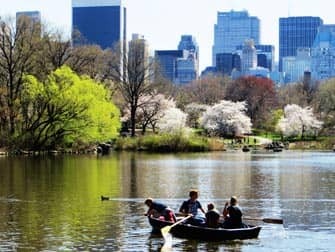 If you’re going to New York with your family, it’s a great park to visit, since there is something to do for all ages. While your children take a (supervised) ride on a pony, you can relax. You can also rent a paddleboat and have fun with the whole family.